Pictured Left to right: Future Society Member, Britaine Bell, Jay Smith, Erica Taylor, KaDarra Mckissack, SAVE's Youngest Volunteer, Wesley Patton, Future Society President Porche Stanley and Member Christin Killcrase. The Future Society, an organization on MTSU campus, has adopted SAVE as their charitable organization for the year. 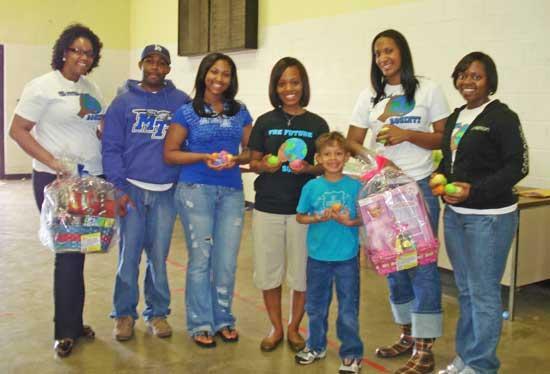 The Future Society sponsored an Easter Egg Hunt on April 3 for the children affiliated with SAVE. Fourteen children from 18 months to 10 years of age enjoyed a day of egg hunting fun, games and prizes. We greatly appreciate the Future Society Members hard work and dedication to this agency. It is evident, they are living up to their purpose "To promote growth and development in the community by educating and informing the public and volunteering their time and efforts were it is needed." Thank You again Future Society for all you do.